This trial investigated the effects of probiotics on the incidence and duration of diarrhoea and respiratory infections in low-socioeconomic communities of East Jakarta, Indonesia. In a 6-month double-blind, placebocontrolled study, 494 apparently healthy children aged 1-6 years were randomly assigned to 4 groups: to receive low-lactose milk with low calcium content of ≈50 mg/day, (LC, n=124); low lactose milk with high calcium ≈440 mg Ca/day (RC, n=126); RC with 5×10^8 CFU/day Lactobacillus casei 431 (n=120); or RC with 5×10^8 CFU/day Lactobacillus reuteri DSM 17938 (n=124). Primary outcomes were the number and duration of acute diarrhoeal episodes. Number and duration of acute respiratory infections were secondary outcomes. 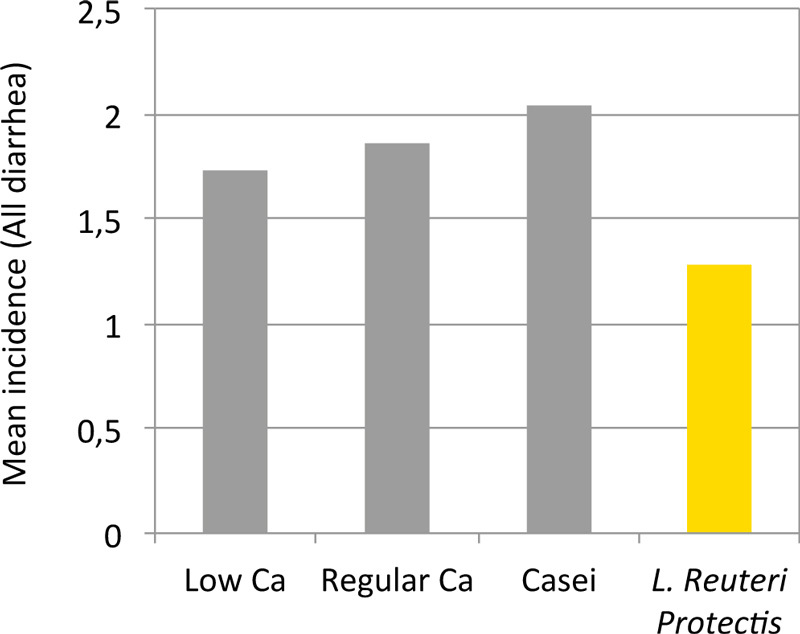 The incidence of WHO-defined diarrhoea (≥ 3 loose/liquid stools in 24 h) did not differ between Lactobacillus casei and RC (RR: 1.21 [95% CI: 0.76–1.95]) or between Lactobacillus reuteri and RC (RR: 0.76 [95% CI: 0.46–1.25]). There was also no difference between the LC and RC groups. The incidence of all diarrhoea episodes (≥ 2 loose/liquid stools in 24 h) was significantly lower for Lactobacillus reuteri compared to RC (RR: 0.68 [95% CI: 0.46–0.99]). Further, the incidence of both WHO-defined and all episodes of diarrhoea were significantly reduced in the Lactobacillus reuteri group among children with lower nutritional status (below-median height- and weight-for-age Z-score). None of the interventions affected the incidence or duration of respiratory infections. Regular calcium milk alone or with Lactobacillus casei did not reduce diarrhoea or acute respiratory infections in Indonesian children. Lactobacillus reuteri DSM 17938 prevented diarrhoea and exerted effects especially in children with lower nutritional status. Agustina R, Kok FJ, van de Rest O, Fahmida U, Firmansyah A, Lukito W, Feskens EJM, van den Heuvel EGHM, Albers R, Bovee-Oudenhoven IMJ. Randomized trial of probiotics and calcium on diarrhea and respiratory tract infections in Indonesian children. Pediatrics 2012;129: e1155-e1164.